August | 2013 | Linden Optometry A P.C. The Doctors versus the Optometric Assistants! 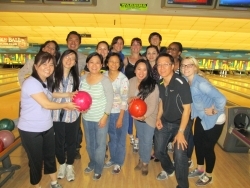 A small group of doctors from Linden Optometry, PC took on the optometric assistants in a bowling match last Thursday night. The competition started at 9:00 PM at the Brunswick West Covina Lanes. The doctors’ team, consisting of Alan Limfat, O.D., Nancy Luan O.D. and M. Emily Linden O.D. played a long, difficult game against the assistants, including Marian, Jeanne, Christine, Delaney, Gerard, Gerard’s wife Genesis, Crystal, Maria, Tanya, Ashley, Phalona, and Sean. Marian and Crystal were the MVP’s of the evening, with skills that amazed everyone. This was just the beginning . . . Since everyone had an enjoyable night, they are planning another night out soon. About Linden Optometry: Linden Optometry, a Professional Corporation, is a full service vision-care center, offering designer eyewear and sunwear, eye exams for the entire family (from infants to seniors), contact lenses, and treatment of eye infections and minor eye injuries. Linden Optometry has won the “Best Eyewear in Pasadena” award 19 years in a row, and was voted ” #1 Fashion Eyewear in L.A.” by myfoxla. Founded in 1956, Linden Optometry has become a destination spot for fashion shoppers from all over Southern California.